Featured / Recipes / 09.06.2014. 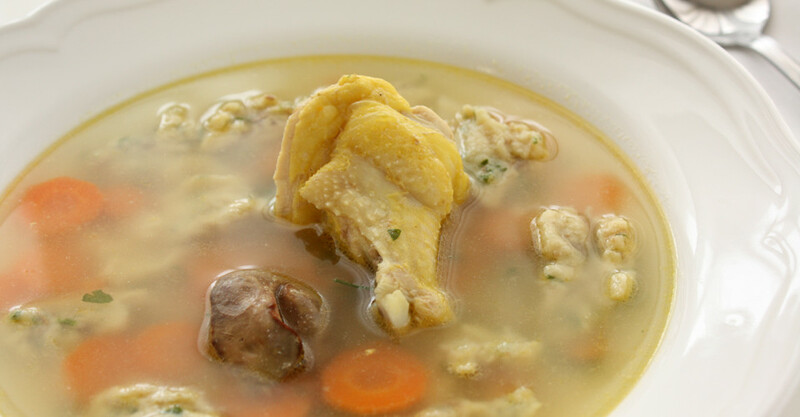 Eingemachtes (ajngemahtes) translated from the Agramer or Zagreb dialect represents a simple and tasty chicken minestrone with root vegetables and liver dumplings. Separate chicken wings from drumsticks. Place them together with the offal in a deeper broader pot and cover with lukewarm water. Add finely sliced root vegetables, sprinkle with salt and gently cook half covered about 40 minutes. Melt butter and stir in flour. Take some of the stock (soup) and pour over flour. Leave shortly over heat stirring constantly just until smooth, which mixture is then poured back into the chicken minestrone. For dumplings finely chop liver and cut away any sinew. Beat eggs with salt, add liver and parsley and mix well. Gradually sprinkle flour and mix until smooth. Leave shortly to rest. Boil water in a broader pot, form with a spoon little dumplings and boil them for 10 minutes. Drain and add to the chicken minestrone. Add fresh chopped parsley to the chicken minestrone (eingemachtes).